Hanukkah, the eight day holiday that began last night, is also called the Festival of Light. For me, it’s the festival of delicious foods. Latkes, fried potato pancakes, are probably the most well known of all the holiday treats. But donuts should get some love, too. 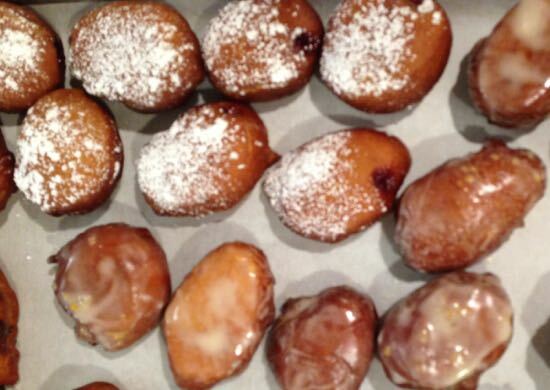 Zufganyot, or jelly donuts, have a place on every holiday table. They are surprisingly easy to make and a show stopping sweet for your celebratory meal. I’m planning a cross-cultural Christmas brunch that will include these delicious donuts filled with my homemade raspberry jam. Butter a large bowl and set aside. Fit the dough hook onto the stand mixer. Warm the stand mixer’s bowl with hot water, dry well, then combine the yeast, 1 tablespoon flour, 1 tablespoon sugar and 2 tablespoons warm water and stir with a spoon. Let the mixture stand for five minutes to test the yeast’s activity. It should be bubbly and lively. In a small bowl, whisk together the remaining sugar, egg, yolks, sour cream, vanilla bean seeds, lemon juice and zest, brandy, and salt. Add to the stand mixer along with 1 cup of the flour and mix until combined. Add the butter and the remaining flour, alternating in three additions. With the dough hook, combine until smooth before making each addition. Continue to knead with the hook until the dough pulls away from the sides of the bowl. This entire step will take about 10 minutes with the mixer set on 4. Lightly flour the counter and scrape out the dough. Knead briskly until elastic and smooth and a little shiny, about three or four minutes. Place in the buttered bowl, turning to coat, and cover with a kitchen towel. Place in a warm spot and let rise until doubled in bulk, about 2 to 3 hours. Keep the bowl off any cold stone counters. Instead, place on a wooden board or a stack of kitchen towels. The dough will not rise for awhile, which can be disconcerting. After about 90 minutes, the rise will begin and it will happen quickly after that. I often make the dough ahead and let it slowly rise in the refrigerator, then remove and bring to room temperature about 90 minutes before cooking. Once the dough has risen and springs back when poked with your fingertip, it’s time to form the donuts. Line a baking sheet with parchment. Lightly flour the counter or board and roll the dough out until about a inch thick. 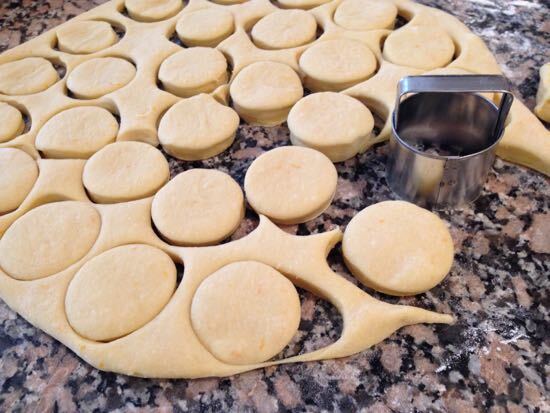 Using a round cookie cutter or biscuit cutter, cut the donuts. Twist the cutter as you cut (unlike biscuits) — this is very important – if the donuts don’t get that twist, they will cook more like a biscuit, showing off their layers. Keep them together by firmly turning the cutter as each donut is formed. You can make the donuts tiny with a 1-inch cutter, or donut shop sized with a 3-inch cutter. I like to use one about 2-inches in diameter — three bites! Cover the baking sheet lightly with a kitchen towel and place in a warm spot (off the cold counter) until doubled in bulk, about 1 hour. Do not let the donuts rise too far – if they over-proof they will be difficult to fry. There is no turning back from over-proofed dough! In a heavy 3 or 4 quart pot, heat the oil to 350°F. Use a candy/deep fry thermometer! Watch the oil very carefully. It will easily go to 400° or even higher and the donuts will burn. Regulate the heat continually. Line a baking sheet with paper towels. Using a spider or a slotted spoon, carefully place the donuts into the hot oil, cooking for no more than 2 minutes, rolling them around the entire time. They will fight with you a little and will not want to turn over. Just dunk them, essentially drowning them in the oil! In a matter of moments, they will be golden brown. Remove immediately and drain them on the paper towels. Check the heat of the oil before proceeding with the next batch, allowing the oil to return to 350°F each time. The frying process will take about 30 minutes altogether. Let the donuts cool slightly then fill or glaze. Use a pastry bag or a ziptop bag, fitted with a metal tip. Shove the tip deep into the donut and squeeze in the jam until you feel the donut get a little heavy and the jam oozes a bit from the insertion spot. To frost, just dip the cooled donut in the glaze, then let the glaze set up for a minute or two before serving. Eat these treats right away. As if I could stop you. Warm the cream in a small saucepan. When tiny bubbles edge the pan, remove from the heat and pour over the chocolate. Stir until the chocolate melts and the glaze comes together. Add the extract and butter. Cool slightly.Dip the top of the donut in the glaze. In a small bowl, add the sugar and the juice. Stir until combined and a thick glaze forms. Stir in the zest and vanilla. Dip the top of the donut in the glaze. Thank you for the Donut Filling and Glazing Ideas. My son will surely love the new filling i will put on the Donut that i will cook this coming weekend for our mini family picnic in the park. I cant wait to cook. I have listed all the ingredients i need to buy tomorrow for the weekend picnic.